CCube certifications are vendor-neutral. We offer competency certifications in concepts and software pertaining to Architectural Engineering and Construction, Product Design & Analysis, and Project Planning & Management. Currently we certify the competency of students in engineering software products from the stables of global product companies like AutoCAD, Bentley, Catia, Dassault Systèmes, PTC, and Siemens; and the project management and planning software of software majors such as Microsoft, and Oracle. The certifications are graded – we offer Associate, Professional, Expert, Master certifications. You can go for the one that suits your skills, experience and objectives; move from the basics to the advanced. Choose suitable competency certifications from the list below, prepare, and appear for a 60-minute online test of 60 multiple choice questions. What does CCube stand for? CCube stands for Competency Certification Centre. It offers competency certifications for individuals in various software and modules. What is the need for competency certificates? Competency certificates demonstrate a student or professional’s industry readiness, high degree of specialization and expertise in the chosen field. A third-party certification adds value to resume, highlights dedication of students to continuous skill growth; gives a head-start for them in the highly competitive job market. What are the benefits of CCube certification? CCube certifications are recognized by industry. Our certifications carry a strong brand value. Since they are vendor-neutral, our certifications are considered more reliable that competency certifications issued by product companies. Who should take certification tests? There are no eligibility criteria for taking up any of the examinations. If you want to evaluate yourself on the knowledge level of a particular software or module and test your competency, you can go ahead and take up the online CCube competency test any time. 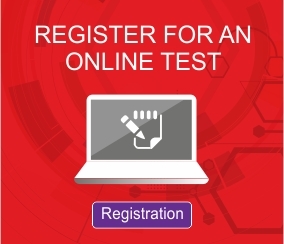 How do I register for an online test? Fill your details, choose your subject of exam, Test centre and make online payment. Within 48 hours you'll receive an E-mail or Phone Call regarding your Exam Hall ticket processing. Reach the Online Test centre on time mentioned in the Hall ticket/Admit Card and you shall take the Online Examination. Can I take the test anywhere in India? Yes. But you can take the test only at our authorized centre, and not from anywhere else. Just contact the nearest authorised CCube test centre or e-mail us at info@ccube.asia for more details. What is the duration of the online test? Each test will be for a total duration of 60 minutes. The test is conducted online and will consist of 60 multiple choice questions. What is the test format? What will I be tested on? The online test is based on the Multiple Choice Questions format. You will need to choose the most appropriate answer from the list of options given. You will be tested on the particular software version or module you had chosen. How can I reschedule my test? You can reschedule the test by contacting the centre where you registered for the test. Can I cancel the test? No. You can only reschedule. You cannot cancel the test under any circumstances. What should I bring with me while appearing for the test? We will send you a voucher via email after you successfully register for the test. You need to bring a printout of that voucher. Since this is an online exam, you need not bring any stationary items like pens, and rulers. What is the passing score of the competency certification test? We use a modern and systematic grading system in order to evaluate your competency. The grades and the corresponding scores required are highlighted as below.